STEAM Ahead Story Times will end for the summer after Thursday, April 25. They will resume in the fall. This will give Youth Services time to visit schools to make all students in the School District of Oconee County aware of our great summer reading program for 2019! Harry Potter-themed Sock Drive a big hit! The Oconee County Public Library was blown away with the generous support shown by the community for our Dobby Sock Drive. With your help, we collected over 1,170 pairs of socks! Wow! These socks have been distributed to Collins Children’s Home, Safe Harbor, Lakeview Assisted Living, and Our Daily Rest. Thank you to everyone who contributed! NEW RESOURCE for library users! Make sure to check out our Digital Learning page. We’ve added the Merck Manuals. These are high-quality, independently vetted sources for medical professionals, consumers, and even veterinary needs! 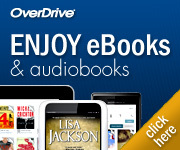 Go to http://oconeelibrary.org/ocpl-digital-learning/ to enter a search and try it out today!